This middle school book review focuses on the life of Anne Frank. Anne Frank was a very amazing girl. She lived in a small secret annex for two years with no privacy, very little food, and only the slightest hope of freedom keeping her alive. Anne kept her faith through all of this. She lived through something that I know would have been too difficult for me to live through. If I were forced into hiding, one of the hardest things for me would be having to spend so much time around my parents. I enjoy having time to myself. Being around my parents for long periods of time wouldn’t work too well for us. We need our own space. It would be like a time bomb waiting to go off. I would probably blow up in somebody’s face for something stupid. I don’t think I would be very pleasant without having some time to myself, which there is very little of when you’re living with so many people in such a small place. Another thing that would be hard for me would be not being able to sing, which I love to do. I always sing along with my favorite artists when I play their music, but I wouldn’t be able to make that much noise in the Secret Annex. Singing always makes me happy. Without it, I would lose a big part of my life. Another thing that would be hard for me would be not being able to go outside. I love watching nature leap to life in the spring. I like to look for the first buds on a tree, and feel the warm breeze of fresh air on my skin. I also love the vivid colors of fall. I like to crunch through the colorful fallen leaves in the crisp air of fall. Spring gives me hope. Fall gives me comfort. It would be hard to see either of them through the darkened windows of the annex. Anne Frank learns to live without privacy, without being able to sing, and without fresh air which is something that I’m not sure I could do. These are just some of the things that we take for granted until we no longer have them. It is at those times that we realize how rich we really are. 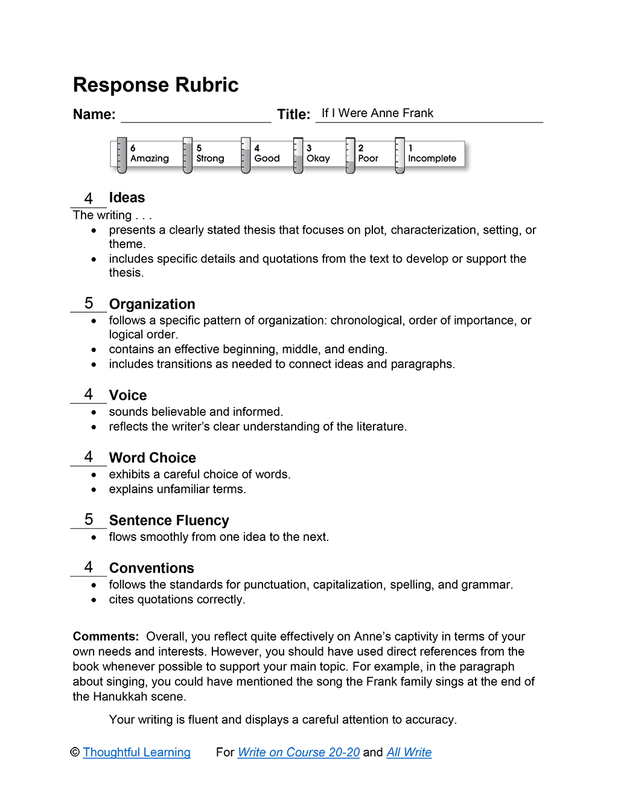 If I Were Anne Frank by Thoughtful Learning is licensed under a Creative Commons Attribution-NonCommercial-ShareAlike 4.0 International License. Based on a work at k12.thoughtfullearning.com/assessmentmodels/if-i-were-anne-frank.